Cedar Rapids Area Association of Realtors presents- Hope for the Holidays! 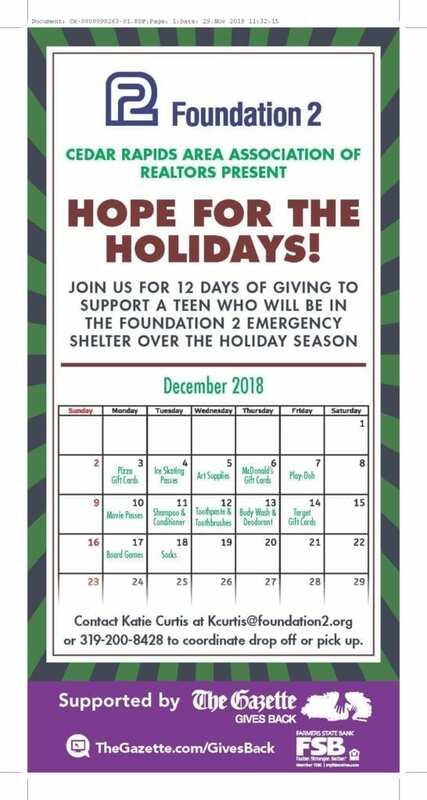 Join us for 12 days of giving to support a teen who will be in the Foundation 2 Emergency Shelter over the holiday season. Participating is easy! Contact Foundation 2 at (319) 362-1170 or email Katie Curtis at kcurtis@foundation2.org to discuss drop-off or pick-up options. Thank you for supporting youth in crisis!